Teletubbies Hill is one of several gems on Nusa Penida Island. This island does provide an opportunity for a lovely and fun experience. To get to this island, can be done by fast boats from: Sanur, Kusamba, or Padang Bai. Here, you can spend the holidays, explore the uniqueness, and enjoy everything the island has to offer. 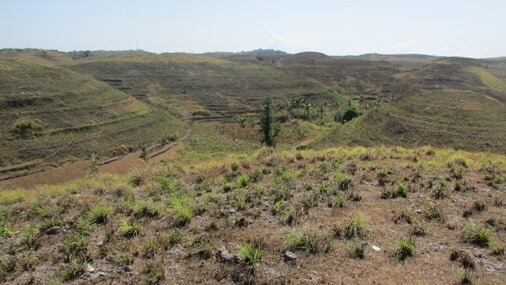 The hill itself is situated on the eastern side of Nusa Penida, between the hamlet of Julingan (Tanglad Village) and the hamlet of Sedehing (Sekartaji Village). This place is covered with the peaceful surrounding and enchanting atmosphere. The name "Teletubbies" is very familiar, given by the visitors who come here. A scenic landscape of green hills and marvelous nature. This is similar to the background of green hills, where the four colored and odd characters live, in the television show called Teletubbies. Green grasses and plants will flourish in this place during the wet season, and visitor will be awed by its beauty. The locals usually come here looking for plant and foliage to feed their cattle. The best time to visit this place is in the morning, inhale the fresh air, and enjoy the astounding sunrise as the clouds carrying its colors, really relaxing and exhilarating. This place is also an impressive location for special moment, especially for pre wedding photo-shoot.